CSC Services is a very experienced contractor who has for many years used UHP Jetting (Ultra-high-pressure Jetting) on various projects. Our team are trained in the use of high pressure water jetters up to 36000psi and are members of the Water Jetting Association. UHP Jetting or High Pressure Water Jetting can be used in the demolition of structures or materials such as concrete and masonry. This has distinct advantages over conventional methods. The risk of fire or explosion is removed and dust is controlled. Ultra High Pressure Water Jetting (UHP Jetting) is also used to remove old coatings which lower pressures cannot. Coatings needing Ultra High Pressure Water jetter removal might include bitumen, epoxy, limpetite and polyurethane. Ultra High Water Jetting is also used in surface preparation of concrete, steel and other materials to create a good surface profile which will aid adhesion and bond between substrate and the applied material/coating. Ultra High Pressure Water Jetting also uses small amounts of water which makes this a cost effective, environmentally friendly, time saving option. Get in touch today to see how we can help your business or organisation. Ultra High Pressure Water Jetting is regularly used across projects to prepare surfaces for the installation of protective coatings. The image shows the surface preparation of the Mixed Bed Regenerator Vessel at Dungeness Power Station ahead of a chemical coating being installed. Ultra High Pressure Water Jetting at 36000psi was used followed by grit blasting to standard Sa3. 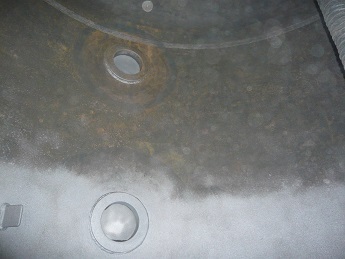 The difference between the two processes can be seen in the photo with the bottom section grit blasted. You can read more about this project here.